This special offer is for those who've risked their lives defending us. 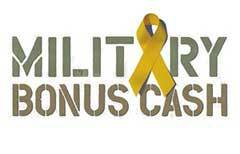 If you're Active, Active Reserved, Retired Military, Retired Military Reserve or are an honorably discharged veteran within 12 months of discharged date, you're eligible for up to $500 in Military bonus cash under our Military Incentive program. Offer applies to purchases and leases on all new 2016 FCA US LLC brand vehicles (excludes Chrysler 200 LX). Must take delivery by 1/4/2017.